Ally Photographing Ally! 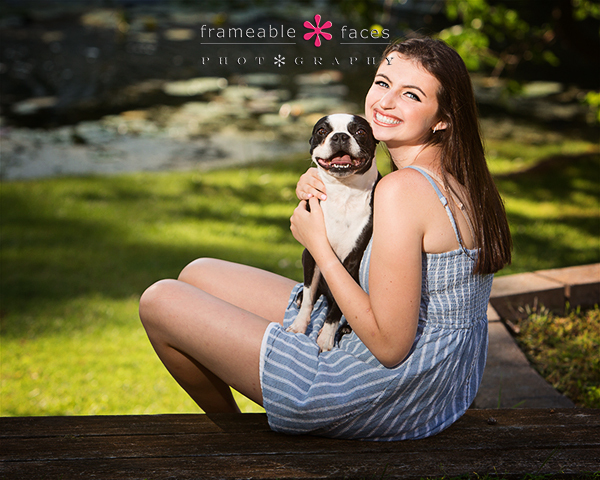 Does It Get Any Better For A Senior Session? Ally photographing Ally is about as good as it gets. 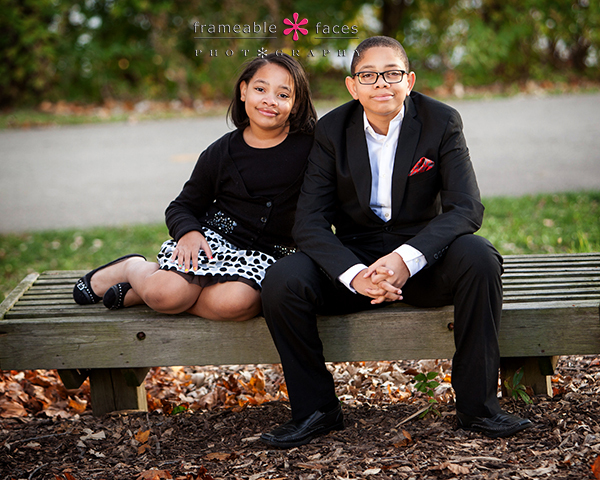 Especially this Ally since her mom Teri was inspired by our Ally to use the name Ally for her daughter! So with this senior session the circle of life is complete!!! 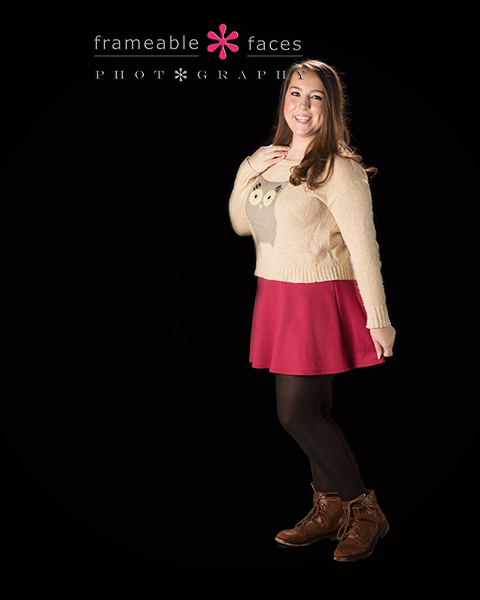 Haha… Ally is also a legacy here since we photographed her sister Julia, so a fun day was definitely in store and a fun day we had. Let’s take a look at some of the highlights! Love it and Ally looks beautiful! Love when the pets jump in! That’s Black and White Baby Joe!!! We’ll leave you with this final photo of Ally getting in the water! Love it. 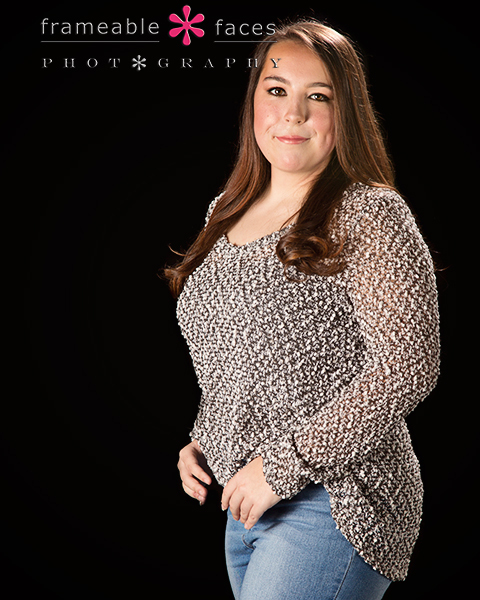 And love Ally photographing Ally! We hope you enjoyed the highlights of our day with her! Pamela, Michael and GEORGE! A Doggone Great Session! 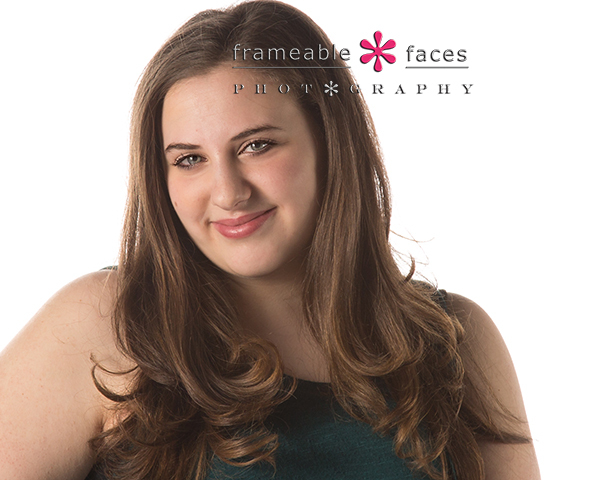 Pamela had been here in our studio before for some headshots and she is a delightful gal! 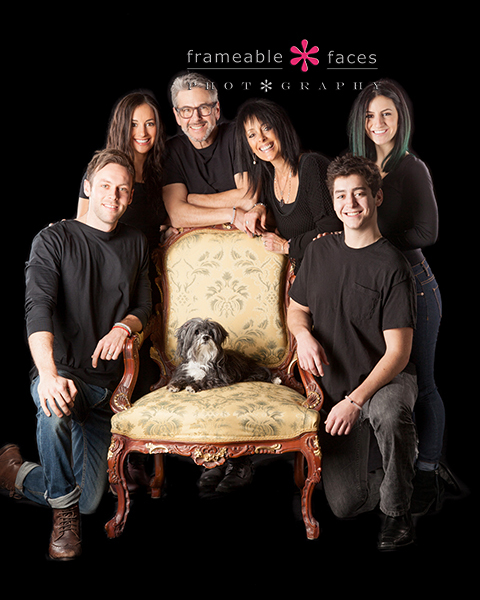 So when she called us to come back to the studio we were excited – even more so when she informed us that she would be bringing her hubby Michael and their French Bulldog George!!! 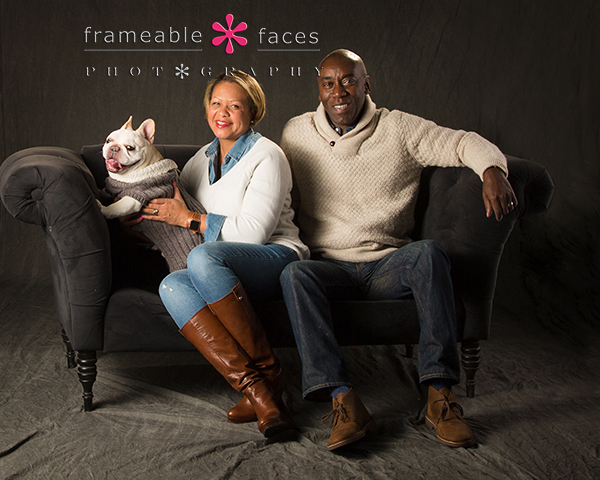 You have to love French Bulldogs, and George is a character – we knew this would make for a doggone great session! George was getting plenty of lovin’! Happy pup! We also have some great behind the scenes fun from the shoot where we get up close and personal with George with the replay of our live Periscope broadcast! 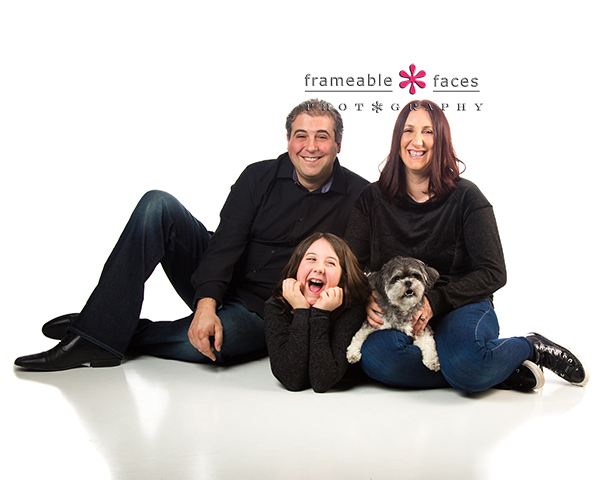 If you want to join in the fun on our channel on Periscope you can do it by following us at @FrameableFaces here or if you are on twitter and just want to watch from there you can at this link. Let’s get back to a couple more photos now – one more close up this time just of the happy couple! George was stylin’!!! 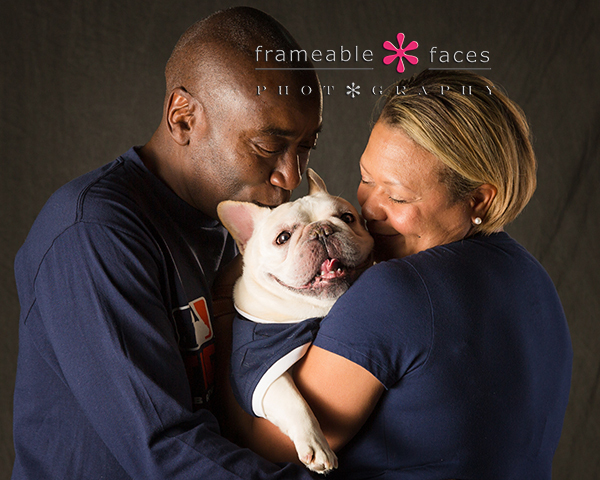 And there you have it – you have to agree with us that these photos are indeed doggone great! We hope you enjoyed the highlights of our time with Pamela, Michael and George! 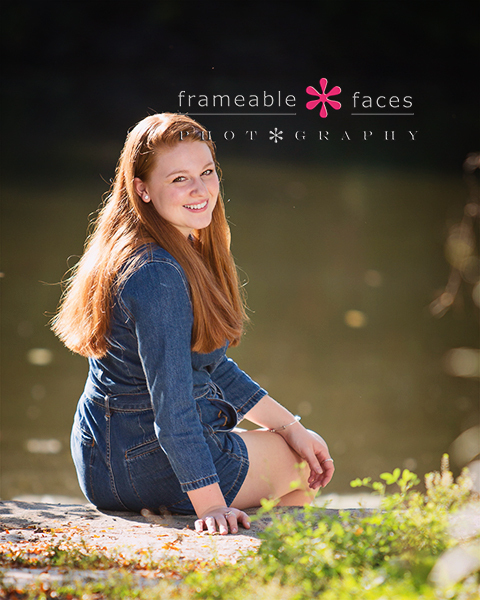 Caitlin (and Patrick) On A Perfect October Day For Senior Photos! So this is indeed the story of Caitlin’s senior session which took place on a perfect October day in Birmingham, Michigan! But Patrick was a welcome addition and companion and he helped make the session even more fun! 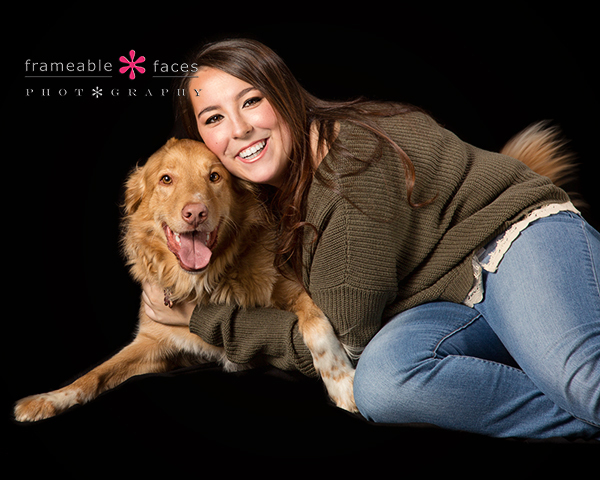 Patrick is a girl’s best friend – a young Collie with plenty of energy, and he posed quite nicely for a couple of shots! Meanwhile we enjoy Caitlin a lot and her mom Deborah is a delight too! We had plenty of fun and laughs on this bright sunny and warm day! 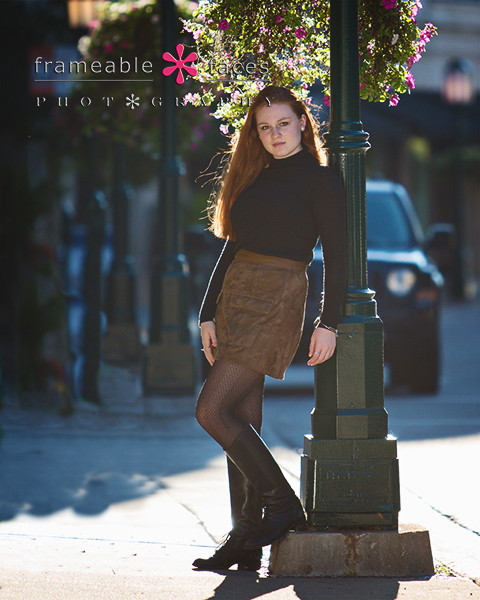 Actually the warm weather lasted much longer than usual this year and that made for more days like this deeper into senior season than you can usually expect… Besides, Caitlin’s session was almost all on location so we got to enjoy a beautiful day. Here’s the replay of the live Periscope broadcast from this part of the session. If you want to be a part of our broadcasts in the future you can download the app and follow us at @FrameableFaces here, or you can just watch from Twitter! ….and time for another outfit change! We took to Facebook Live as well for some more behind the scenes fun as we moved into downtown Birmingham – check it out! We’ll leave you with this last photo from the city… love the lamp post shot! 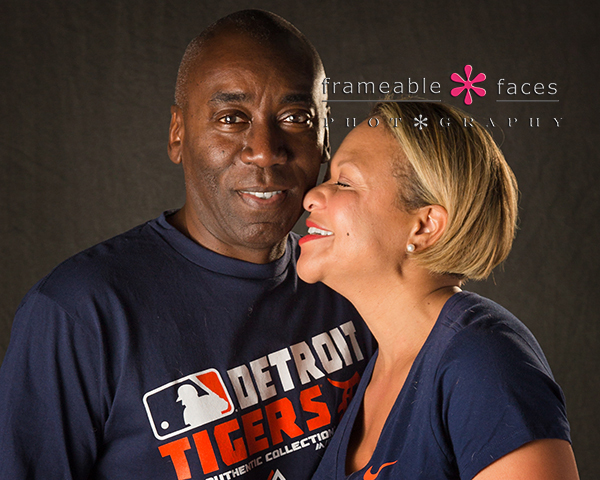 And there you have it – a perfect October day with a fantastic girl! We hope you enjoyed the highlights of our day with her! 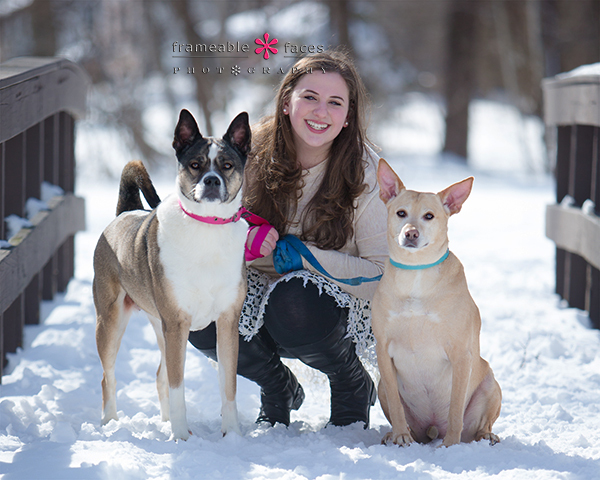 Blair’s Beautiful Wintry Blast of a Session! Blair’s Beautiful Wintry Blast was…..well…..a blast!!! We alluded to this before but this winter of 2015-2016 was a tricky one. I say that because this winter there really was no winter. We only had a few seniors who were waiting for snow to do their sessions and we literally had just enough days with snow to make it happen. No extras at all – no room for error or rescheduling. When we got our precious snow we had to scramble the troops and get outside to shoot!!! We did luck out with Blair since the day that worked out for us saw plenty of snow on the ground from a snow fall two days earlier. Not to mention that it was considerably warmer at this point, so the conditions worked out very nicely after all! Blair deserved it because she is a total sweetheart, and I think her pups enjoyed it too as you’ll see in a bit! And now the outdoor scope! At this point using Blair’s home as a base we headed out into the commons area of the subdivision where she lives (also the one I grew up in) for some wintry photos, and for this first one we had a couple of furry family members join us! Say hi to Kramer and Jelly! So pretty! And so there you have it! 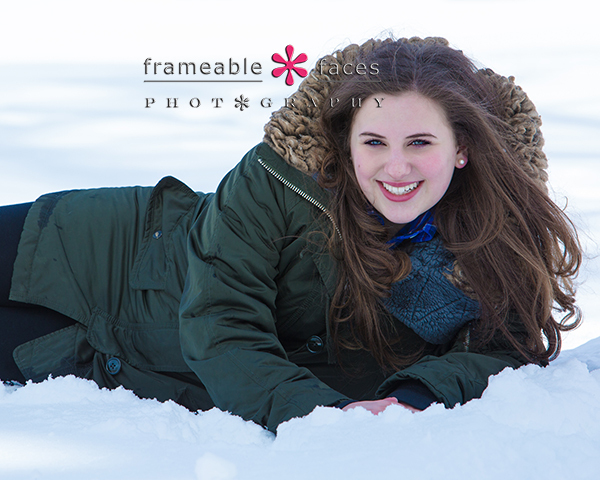 Certainly a beautiful wintry blast of a session with a beautiful Blair! We hope you enjoyed the highlights from our day! 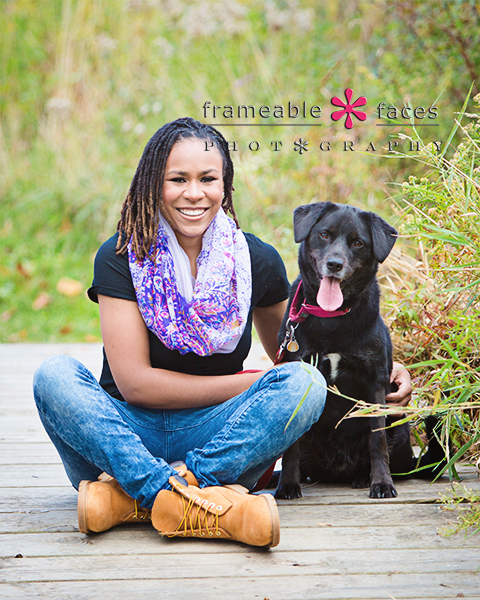 Awestruck By Akwia And Her Awesome Senior Photos! 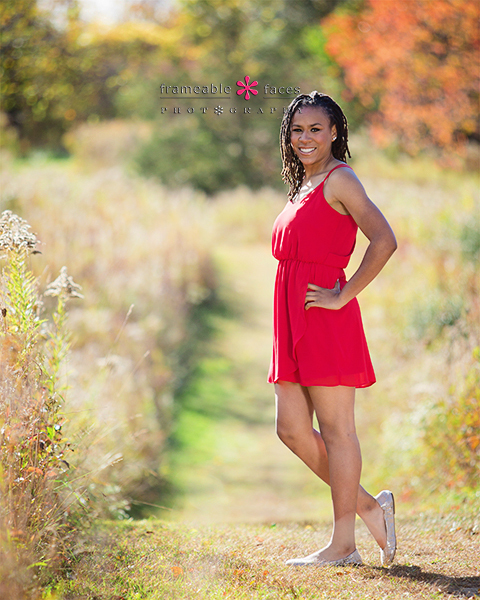 Awestruck by Akwia is how we felt on the day of her session – softspoken and sweet, athletic and beautiful – she’s got the whole package! We had a great time hanging out with her as well as her mom and her pup Sophie! Just a great session overall and we are excited to share a few sneak peeks with you! We started out on location over by the West Bloomfield Library – one of our favorite spots for natural beauty (not to mention a great library as a side note) and the fall colors were in full swing. We’ll start on a trail where you’ll see a nice pop of “Pure Michigan” orange in the distance to compliment Akwia in this lovely red dress. Next we have the extended replays of our Periscope broadcasts from the session for those who want to see a little more behind the scenes. They are linked together (location and studio). 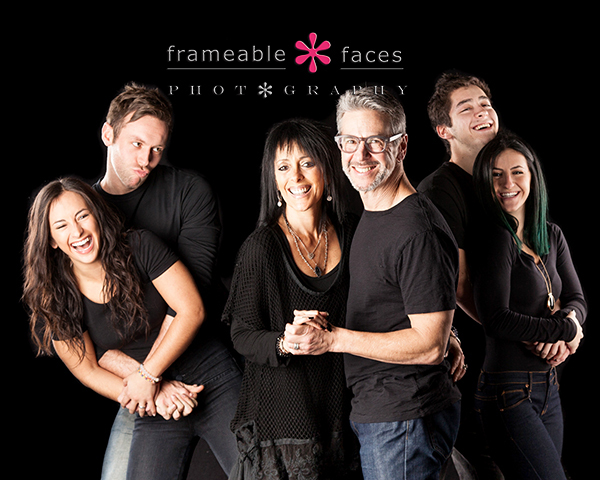 If you still haven’t downloaded Periscope you can follow us at @frameablefaces and do so at this link. Okay now let’s get back to the photos including this one with Akwia and Sophie! 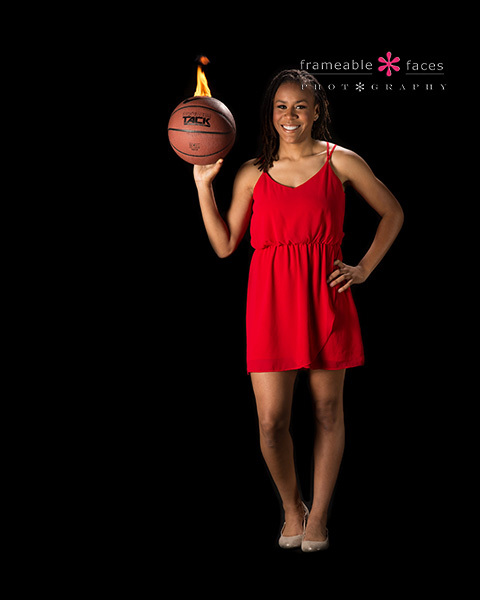 Let’s now head back to the studio where we “turned the heat up” with a little fire in a photo that provides a little contrast of the glamour and the grit! And now we’ll leave you with more of a close up that is just simply Akwia and we love it! And there it is – you can now see why we are awestruck right? 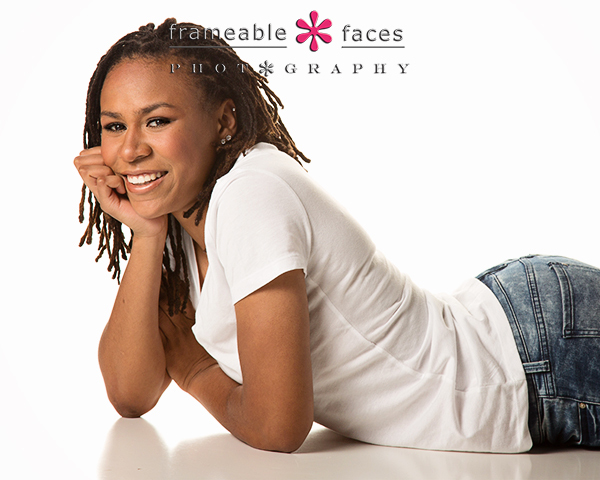 Congrats to Akwia – she rocked this session and we hope you all enjoyed the highlights! 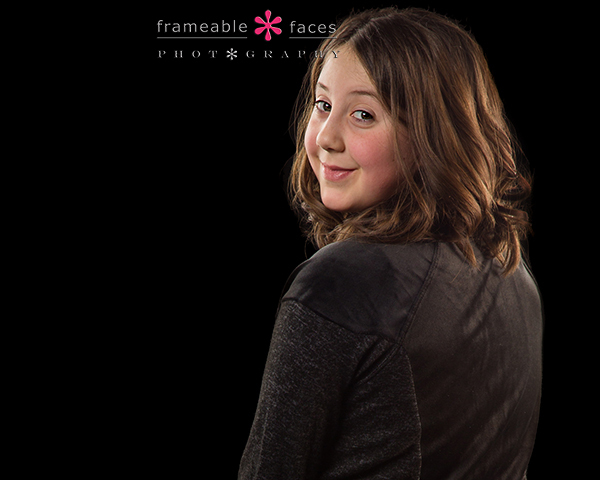 A Superb Studio Session That Was All About Alana! Sometimes simplicity just works. Let me explain what I mean by that. 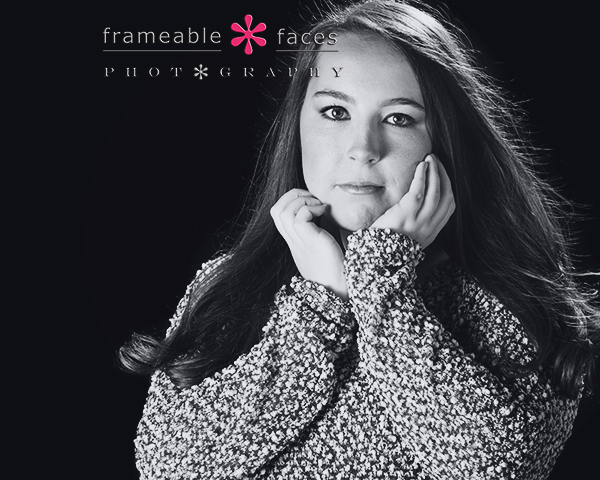 Ally’s approach to portraits has always been about the people, the faces, the expressions, the personalities. 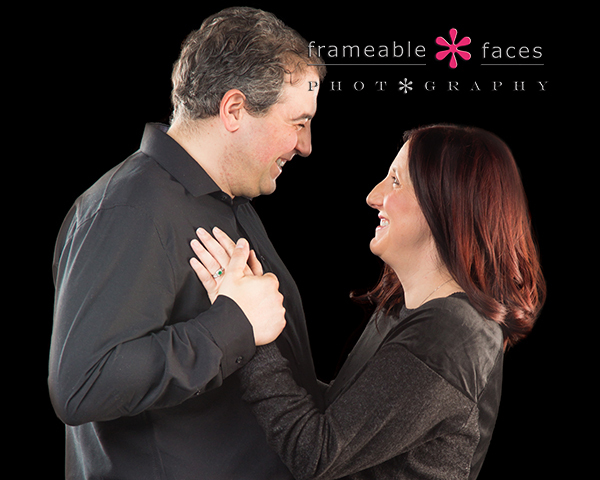 Sure we love our sessions where we go to interesting locations and get beautiful scenery or gritty urban photos, but we’ve always maintained that regardless of how exciting the location is, it has to come back to the subject – the people, the Frameable Faces. 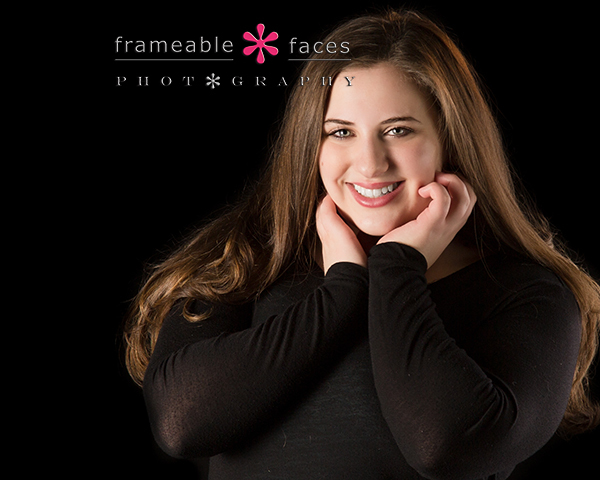 It’s for this reason that a stripped down approach in the studio with a black backdrop can provide plenty of rewards, and that was certainly the case with Alana for her senior photos. Now let’s look at the extended replay of the live Periscope broadcast we did during the session. If you haven’t downloaded the app and followed us there you can do so at this link. 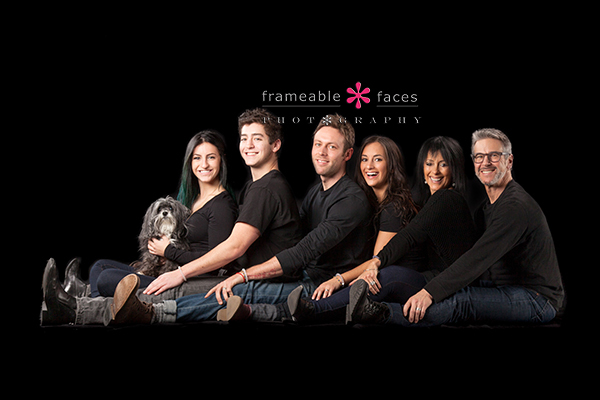 It’s like Frameable Faces TV! Normally we would have the video embedded in the post right here, but due to a technical difficulty we seem to be having with this particular video on YouTube, so you can go to this link to watch it at our Katch.me page instead. Enjoy! Such a dramatic look and we love this look on Alana! We’ll leave you now with one more photo this time with Alana and Eureka! 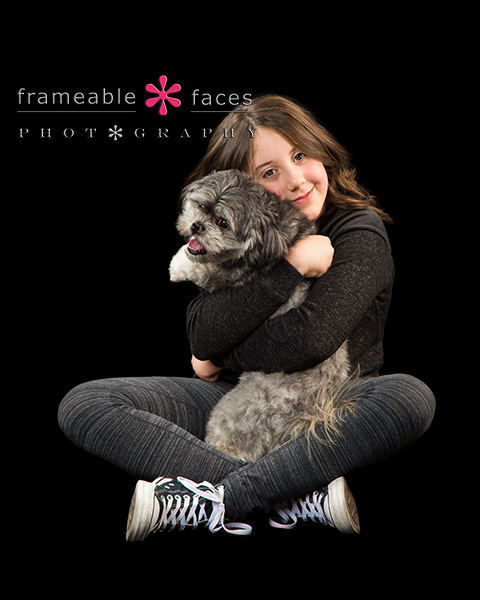 Awww – a girl and her pup. Haha! So there you have it – a simple and superb studio session that was all about Alana (and a little Eureka)! We hope you enjoyed these highlights! 2014 Was A Wonderful and Frameable Year! 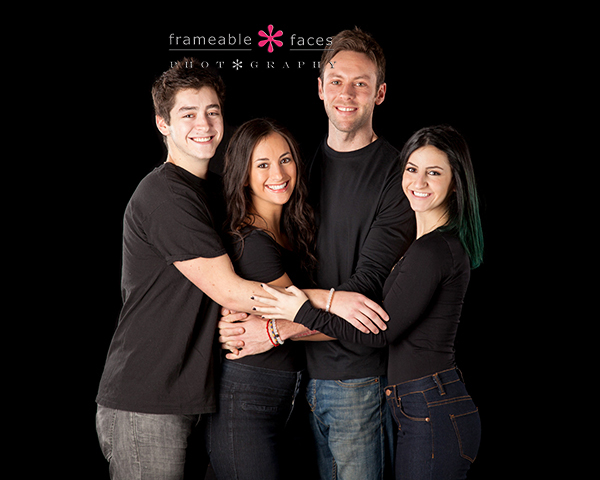 2014 was a wonderful and “Frameable” year that we won’t soon forget and in many ways it was the best year yet for Frameable Faces! As we charge into what should only be the best, happiest and healthiest 2015 possible for ALL of our peeps – we take a happy look back at the past year! Okay so the fact that we assembled a new crew of spokesmodels wasn’t something unique to 2014 since we do that every year, but every class is indeed unique and this one was no exception! A bigger class than usual, we really fell in love with this group and ended up with some great new friends out of it – not just friends of the studio but of our family. We spent a good part of our winter and spring photographing these awesome seniors and I was playing with the panorama function on my iPhone camera the whole time. Let’s reveal all of the behind-the-scenes panoramas from those sessions together here – these aren’t professional shots and they aren’t filtered or retouched but together they are kind of neat! That’s how we spent a good part of the first 4 months of the year, culminating with our spokesmodel party with our usual dinner (catered by Pine Lake Market) and Just Baked cupcakes and that’s where we create our composite which stays in the window of our studio until the next class! Team Frameable Faces participated in the Relay For Life once again to try to help beat cancer and we had a fun and rewarding day raising a nice chunk of money this year. 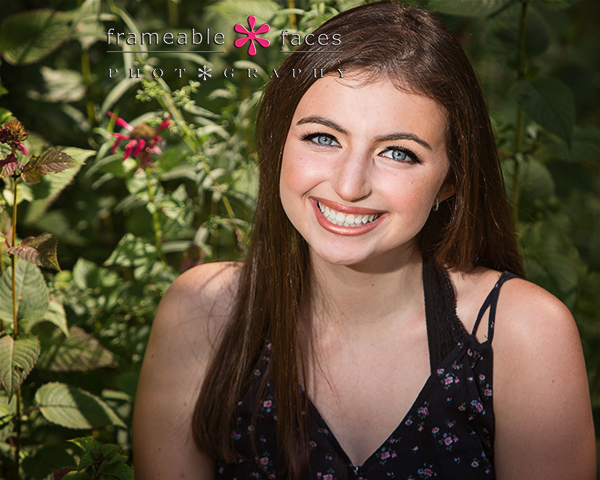 We also continued photographing a whole bunch of seniors and we even took a couple of road trips including one where Ally took some breathtaking photos up at Sleeping Bear Dunes. 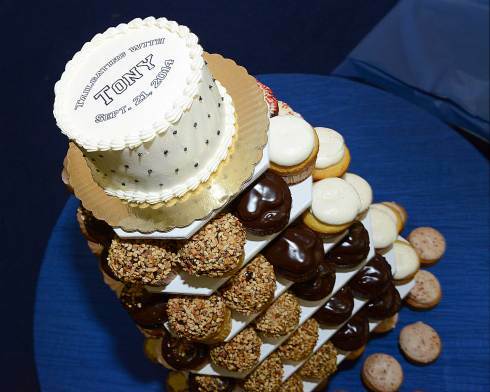 We worked hard this summer and at the same time had to plan and gear up for our son Tony’s Bar Mitzvah! Our heads were spinning most of the time… but it was all good stuff. What an awesome weekend this was! Tony did a great job, the party was a blast, and our photographer – well she’s the best. We hired our own event photographer Angela and it was really cool to be on the other side of the lens and in her capable and talented hands. You can see a handful of highlights from our day here! New Website, other highlights and cruising towards 2015! Reflecto had a bit of a rebirth as well after recovering from an injury and continued to focus on his favorite topic……himself. So that’s our recap – we are thankful for all of you and for a great year and we are looking forward to what will be an amazing 2015! We wish for all of you peace, health and happiness, and we will see you all soon! On Location With Old Friends In The Chicago ‘Burbs! 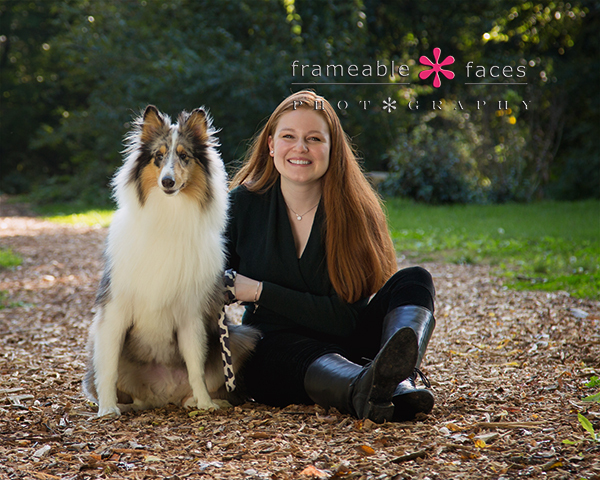 We were recently in Chicago for a family event and while we were there we connected with my best friend from college in the suburbs for a family session on a brisk fall day in the park. 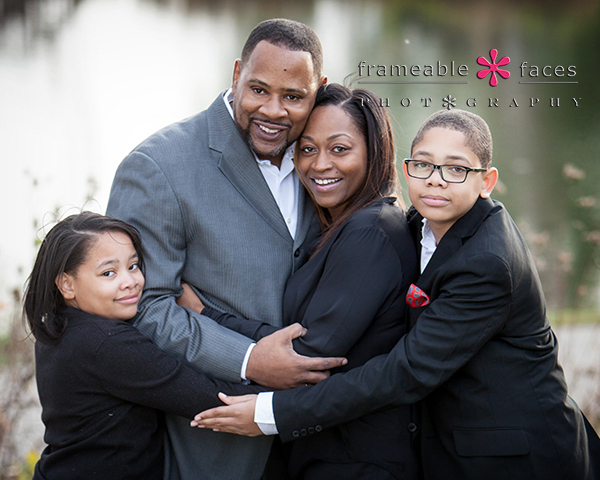 It’s fun to photograph old friends and to be able to get their kids and ours together for a visit during our road trip. We go back over 25 years and it’s always a lot of fun when we get together. 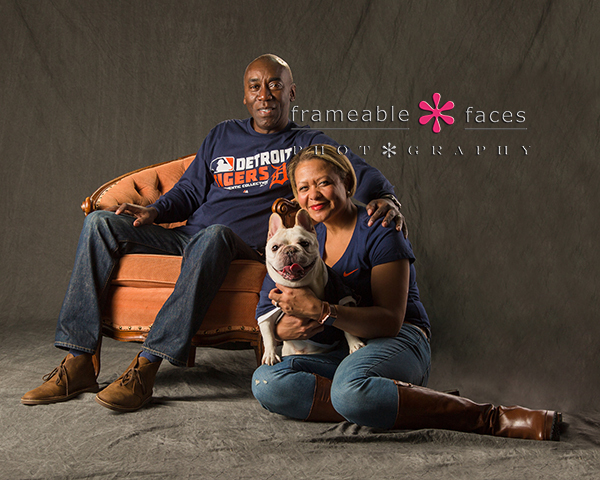 Anyone who knows my buddy Barry knows he’s pretty passionate about his dogs and of course Half-Face and Omar were going to be included in the family portraits. That’s where we’ll start – with all of the family! 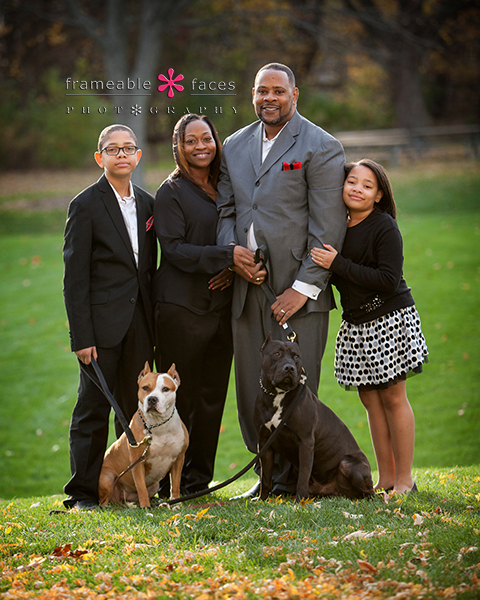 Great family and are those dogs beautiful or what? Next we focused on getting some photos without the pups and if you have been a frequent follower of our work you know Ally is a big fan of the “family hug”! The kids are getting to be so grown up! To you they just look like great looking kids – for me it’s different because I’ve known them from the time they were born! So cute right? 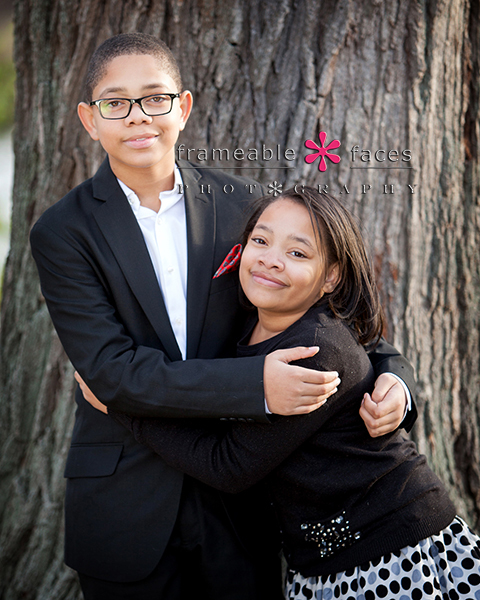 Little sister loving on her older brother! Having a boy and girl ourselves we just know this is exactly how they always get along!!! Right? And one more of the two of them just relaxing and hanging out together. So there you have it – on location with old friends in the Chicago ‘burbs – it’s about as good as it gets for us! We hope you enjoyed these highlights from the session!